In less than 24 hours, it will be September 1st. Because I am a planner--and I think many of you are too--I'm posting the details of the Simplify September project TODAY! That way, you can hit the ground running tomorrow morning! The whole point of Simplify September is to make our lives less complicated. Things tend to get busier and busier during the last few months of the year. Simplify September is a way to slow down, scale back, clean up and figure out what's really important to you. That way, when the holiday season hits (believe it or not, it's just around the corner), you'll know who, what and how to prioritize in order to spend as much time as possible with the people who mean the most to you. 2.) The Simplify September Meal Plans. Week One here. Week Two here. YOU DO NOT HAVE TO DO ALL THESE THINGS. You can do some of them. You can do most of them. You can do none of them and simply follow along and see what other people are doing. 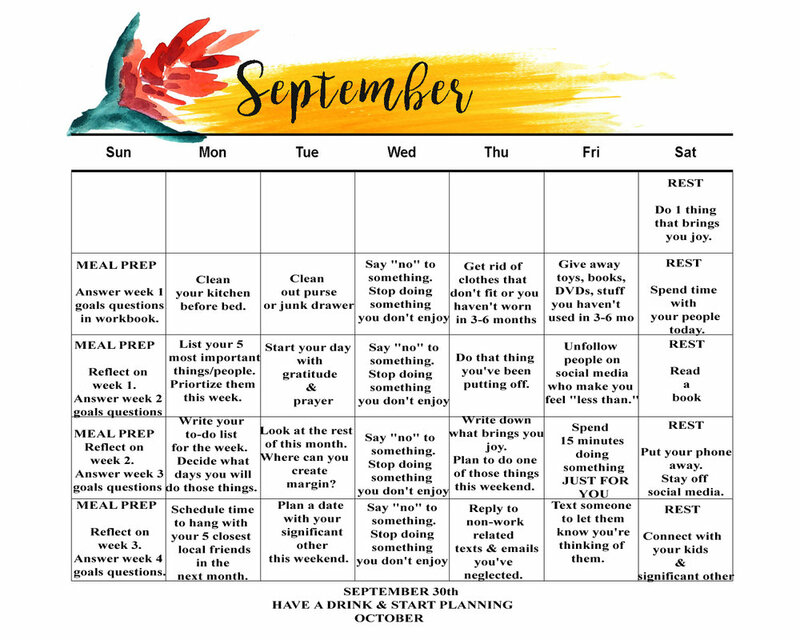 Pretty much everything in the Simplify September project can actually be done during any month of the year. The Simplify September 30-day calendar is at the bottom of this post. Each week on the calendar, we take on a different area of life. In week one, we clear the physical clutter. In week two, we calm the mental chaos. In week three, we simplify our schedules; and in week four, we work on our relationships. Some of the items on the calendar repeat themselves. That's because they are REALLY THAT IMPORTANT. If you find one suggestion extra helpful, try incorporating it into your daily, weekly or monthly routine. On Sundays, we meal prep and reflect. Every Sunday, I will post a new meal plan--with recipes. The meal plans will be updated weekly. Week one is here. Week two is here. I will also take time to reflect on the previous and upcoming week; and I encourage you to do the same. I've created a workbook for each week that includes questions to help you with those reflections. If you want the Simplify September workbook and weekly encouragement from me in your inbox, sign up for the Simplify September email list below. You can find information about the Simplify September capsule wardrobe here. This includes links to most of the items I'm wearing next month. And finally, the Simplify September reading plan is so simple that it doesn't need it's own post: Simply read one chapter from the book of Proverbs every day for the next 30 days. There are 31 chapters in Proverbs, so you'll have to read two chapters one day this month. That's it. In addition to my Tuesday Truth (Tuesday mornings at 7 a.m. PST on Instagram Live), I'll be doing some bonus Instagram Lives throughout the month. I'd love to have some of you join me on those Instagram Lives to talk about the Simplify September project and what you're learning through it. Send me an email and we can try to set up a time for a LIVE CHAT! I'll also be using the #simplifyseptember hashtag when I post something related to the project on Instagram. Feel free to tag your Simplify September posts with the same hashtag! 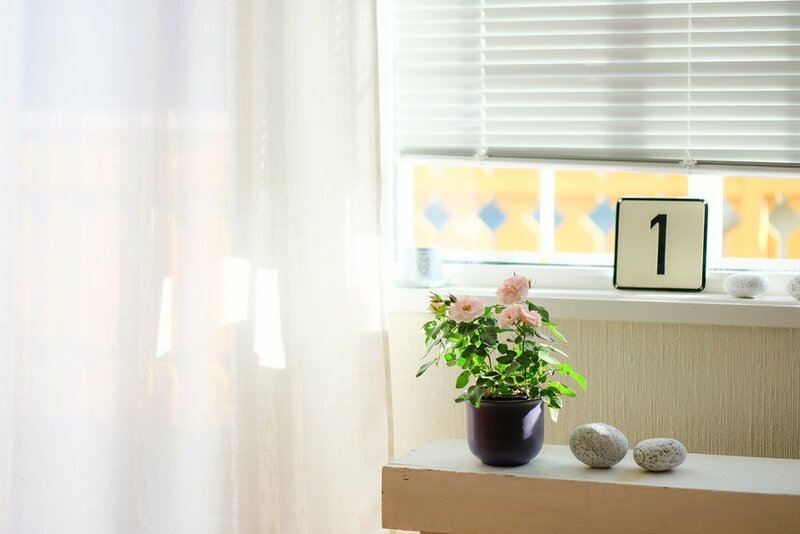 Everything about Simplify September is supposed to make you feel more calm, more organized and more present for the people and things that matter. If something in this project makes you feel stressed out or frazzled or anxious or not good enough, DON'T DO IT! I'm so excited to calm the chaos in our minds, relationships, time and possessions with you! Let's Simplify September together! This calendar was designed by my friend Amy at Amy's Art Table. Weekly reflections & encouragement in your inbox! Can I be honest? I struggle with social media. I vacillate between feeling inferior and alone because it looks like everyone is doing something infinitely more awesome than me or feeling like I'm part of the problem. On an Internet where people only the show the highlight reel of their lives, it's rare to see someone whose feed--and whose life--is beautifully honest. When I think of my friend Blake Guichet, those two words come to mind: BEAUTIFULLY HONEST. One look at her Instagram feed (@thegirlnamedblake), and you'll know I'm right. Blake is both beautiful and honest. She's also a talented writer, a mental health advocate and a self-proclaimed "crappy Christian." And did I mention that she's hilarious?? Blake and I connected through the RISE conference, and though we didn't get the chance to meet face-to-face, I felt confident enough in who she was as a person (and in her amazing graphic design skills) to ask her to re-design This Is Thirty Four. Every interaction I've had with her over the past few months--and everything I've seen her post on social media during that time--has only confirmed that Blake is as real deal. Blake's Instagram feed offers daily encouragement to me to be more intentional (you know I love that word) in the way I'm living my life. Her heart for Jesus and for others shines through in everything she writes. So, read this interview and be encouraged by Blake's words; and then go follow her on Instagram. You'll thank me later! Jenn Prentice (JP): Hey Blake! Thanks for doing this interview. For those that don’t follow you on Instagram (but will after this interview), tell them who you are. Blake Guichet (BG): I’m a born and raised Louisianian, like in the “never lived anywhere else” sense. I graduated from LSU in 2011 with plans to move very far away and begin my career as a writer/speaker, but God had other ideas. I met my now husband, Jeremy, about two months before I graduated, fell head over heels in love, and kept my roots right where they were. We got married a year later, had our first daughter, Pacey, a year after that, and our second daughter Elliot two years after that. We’ve packed a lot of life into the last seven years, but it’s pretty dang beautiful. So now I’m a work from home mom wearing a lot of hats – business owner, graphic designer, writer, sometimes-blogger, and I’m sure a whole bunch I’m forgetting. But I love it. I love our life, and I’m thankful that God’s plan is always better than our best-laid ones. JP: Well, from my perspective, you are rocking each of the hats you’re wearing, especially Magnolia Ink. Tell me more about your business. BG: Magnolia Ink is my branding and website design business, officially born in July of 2017, but it had been kind of lurking in the background in an unofficial sense for years before that. My number one priority in my business is using my abilities to enable other business owners to move forward towards their dreams with a brand and a web presence that accurately represents them. JP: From working with you on the redesign of This is Thirty Four (thank you for that, by the way), I know that you have a well-oiled process for designing people's websites and branding. How did you develop that process? Or maybe a better question is: what lessons did you learn early on that led you to develop such a great process? BG: This question cracked me up because my process is built exclusively off of trial and error. I did (& still do) a lot of “business” things wrong, have to learn lessons the hard way, & put policies in place to ensure they don’t happen again. But I definitely love where my process is now. My two week turn around for a brand and a website is really attractive to a lot of people because it enables me to focus on one client at a time and give them the attention and product they deserve. My business is super automated so that I spend minimal time on the small stuff and maximum time on the things I love and with my people. JP: You have a beautiful blog yourself, but you recently took a step back from blogging. Can you talk about that and why you chose to step back? BG: Honestly, I felt like God was telling me to. Is that a super Sunday school answer? I just started to feel like the blog isn’t where I needed to be putting my energy. So I stepped back and asked Him how he wanted me to move forward, knowing He’d be faithful to funnel my desire to serve Him with my words and thoughts to something else. JP: So, what does rest and simplifying and scaling back mean to you right now? BG: It means keeping my heart in check above everything else. It’s asking myself “why am I doing this, what is my intention? Is it to achieve and to feel better about myself, or is it to glorify the kingdom and use the gifts God gave me?” It feels weird to say that encouraging and challenging others is my “gift,” but I’m learning to lean into that a little more. I recently launched an email campaign where people can subscribe, and I’m sending out a weekly email with everything from Biblical insight to my favorite bra, and everything in between. It feels like a perfect middle ground between blogging and nothing at all. It’s much more personal and more private, but still a huge way to connect with people and continue building a community. JP: Speaking of connecting with other people, one of the things that I think a lot of people can connect with you on is mental health. You're extremely open about mental health and the importance of managing your mental health. Can you talk about your own struggles and some of the things you've learned? BG: I was diagnosed with Generalized Anxiety Disorder and Clinical Depression when I was 20, and it’s taken me about nine years of walking through life with those disorders before I started really openly talking about it. But the biggest thing I’ve learned is that pulling the things that Satan wants to be left in the dark - our struggles, the things he can pin us down with - that’s where the power is. Pulling that stuff into the light and declaring that Jesus already has victory over them, that’s when we win. Because then we get to join in with each other and stand next to our sisters and brothers and then no man is an island. JP: You have a list of resources for people who are struggling with anxiety/mental health issues. Talk about that and how people can get access to it. JP: I think pretty much everything I write starts out as something I need to hear and then ends up as something I share with other people in the hopes that they might benefit from it too. I know your resource guide is touching a lot of people’s hearts and minds and helping them in their journey. Let’s lighten things up a bit. You are such a fun person to follow on Instagram because you are so freaking funny. What role does humor play in managing anxiety/mental health? BG: Hah! This question made me laugh out loud the first time I read it. I don’t know if I’m funny as much as I am painfully honest, but I think sometimes that translates to funny. I absolutely have had to learn to laugh at myself & my circumstances. I honestly use sarcasm as a bit of a defense mechanism, sometimes to a fault (ask my husband). But being able to allow things to roll off your back and have a snarky comment to go with it makes life a little less heavy and can make it feel like the walls aren’t always closing in. JP: And speaking of funny, you want to write a book, potentially entitled "Confessions of a Crappy Christian." I would read that book. I feel like that describes my life...or at least my journal entries..can you talk about your faith, the role it plays in your life and what it means to be a "crappy Christian"? BG: I think that’s going to end up being the official title of the book because so many people identify with it. I know some Christians will probably be highly offended by someone describing themselves as “crappy” in their faith, but my heart and prayer for this book are that not just Christian women are reading it. I want people who have heard about Jesus but are maybe turned off by this idea of perfectionism and holier-than-thou believers to pick up the book and see someone who loves Jesus more than anything, telling the story of how often they get it wrong, and how much Jesus still loves them because of it. JP: Yes! Yes! YESSSS! I think that’s a message we all need to hear, regardless of where we’re at in our faith journey. Well, you know me well enough by now to know that I could talk to you for hours. BUT, I am going to end the interview with the question I ask everyone: At the end of your life, what type of legacy do you hope to leave? BG: Dang. This is a good one. My first thought is my girls. I want my legacy to be two strong, deeply rooted, on fire for the kingdom women who are consistently rocking the boat and confident in who they are in Christ. I want people to remember me as someone who made them feel a little less alone in their day to day crap, who challenged them to be the best version of themselves and maybe made them laugh along the way.